September 28, 2018 by kim 0 comments on "Slow Cooker Low Carb Keto Ham Recipe"
Here is an easy keto slow cooker ham recipe I made recently involving cooking a ham in the slow cooker. It was so simple to make and the end result was low carb baked ham that tasted delicious. I ate the ham both hot and cold. I bought the ham joint a while back from a supermarket and stored this in my freezer. Since buying this ham joint I saw a program that showed you how they make odds and ends of meat look like a proper joint of meat with “meat glue”. I think this is one of those joints of meat so after cooking and eating the ham I won’t be buying it again. Instead, I will buy proper ham joints, from suppliers I trust. The “meat glue” is made from thrombin a coagulated protein plus a fibrous protein called fibrin. These are extracted from animal blood. The most shocking part of the TV program I watched was the fact that the finished joint of beef featured in the program really looked like a prime piece of meat. Oh! how easily we are deceived. The strange thing is the end product was tasty. It’s just the thought of eating thrombin and fibrin that puts me off buying again. 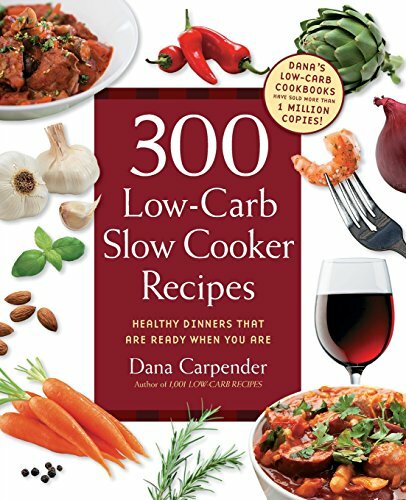 I really recommend reading the book “Low-Carb Slow Cooker Classics” by Dana Carpenter. 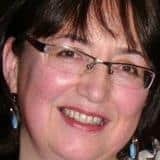 A “must read” for anyone who follows a low keto carb diet. Dana’s book is a mine of useful information. Lots of delicious slow cooker meat recipes and low carb ham recipes. Together with some good low carb alternatives to high carb foods like fauxtatoes (mashed potato substitute made primarily from cauliflower). This recipe inspired by her book is called “Honey Roasted Ham” a slightly odd name as the recipe doesn’t contain any honey – go figure! 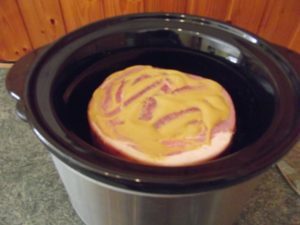 I have always found the slow cooker the best way to cook ham. For the low carb ham glaze I used artificial sweetener if you hate to use artificial sweetener then a tsp of honey would not increase the carbs significantly, as proportionality the honey would represent only a small amount of the total dish. Also, the brown sugar is entirely optional. 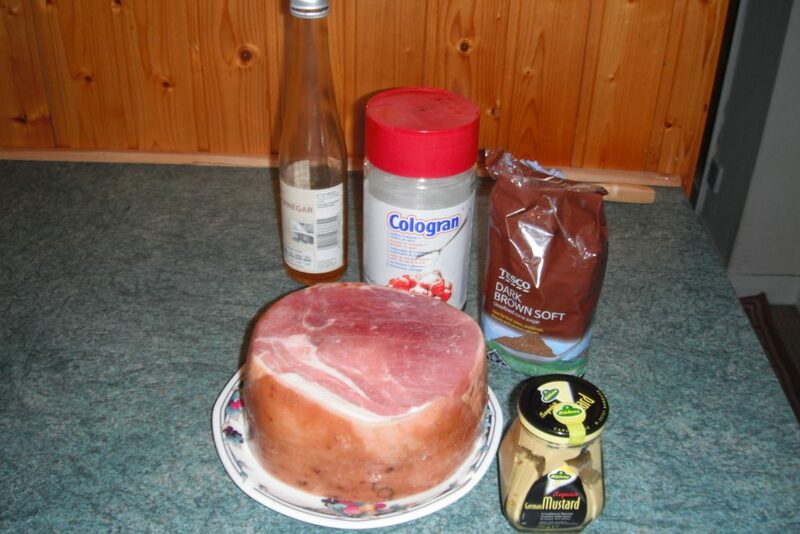 Here is my take on a low carb crock pot ham, that is simple and easy to make. Use this hot or cold for main meals or could be used for lunches with salad or a light snack with cream cheese and olives..
10g artificial sweetener – I used a product that contained aspartame or 1 tsp honey. Mix 6g of the artificial sweetener (or a 1/3 of the honey) with the water, and place this into the bottom of the slow cooker. 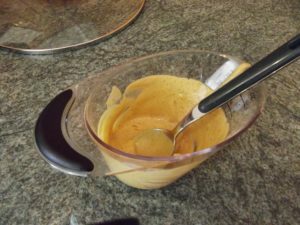 In a jug mix together the sweetener, vinegar, brown sugar and mustard. Use this mixture to coat the meat sides of the ham, don’t cover the fat with the mixture. Place the ham into the slow cooker. This dish will need around 7 hours on the lowest temperature. Once cooked remove the ham joint and leave to rest for about 15 minutes on a carving board then carve and serve. Alternatively, wait until the ham has cooled completely and store in your refrigerator to slice and eat cold. Note that the ham fits neatly into slow cooker. In the bottom of the slow cooker you will find delicious juices, keep these for adding to gravy or add to stock or make the base of a soup, just make sure that you taste the juices first as they may be too salty. The end result was delicious both hot and cold. Well worth the trouble of cooking a ham. How Many Carbs in Spiral Ham? This is a difficult question to answer as the number of carbs in a ham is dependant on the amount of sugar, honey or maple syrup that has been used in the recipe. I have found a good resource for further information on the carbs in spiral ham here.